Caring conversations happen best within a good group of friends or family. 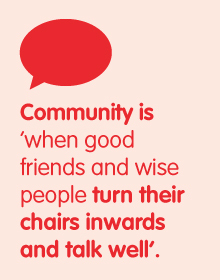 It’s been said that good community is ‘when good friends and wise people turn their chairs inwards and talk well’. This sort of ‘therapeutic’ community is embedded in where we live, does not cost anything and will not easily go away. However, and there’s no shame in this, there are certain times when seeing a counsellor or therapist is both necessary and helpful. Clear boundaries, and seeing someone who you don’t also need to meet socially, can be very helpful. People can choose to see someone at any stage in their lives for any reason, even if they’re not ‘ill’ or in trouble. This might include spiritual direction, life coaching and mentoring – as well as describing some types of counselling. However, here we will focus on counselling for distress and illness. This broad term covers most one-to-one meetings with a counsellor. Change comes from giving the person space to talk, often in weekly hour-long sessions that provide a structure and clear boundaries. People are assisted to reflect on their situation and find their own answers from the resources they have. This approach is good for the issues of life (debt, divorce, bereavement) and for general distress. There’s less evidence it works in mental illness, but it can be helpful if the person is well-motivated. Faith can be one such resource to draw on. Christian counsellors use these skills, but typically supplement this with faith-based contributions, prayer and goals. 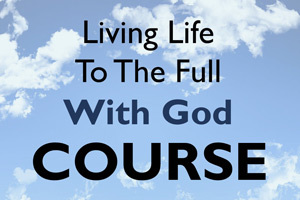 Biblical counselling explicitly emphasises the role of scripture and biblical world-view in personal transformation. The way we behave and think affects our moods. Changing these things can improve how we feel. CBT is good for everyday anxiety and depression, and can be adapted for specific areas of anxiety such as post-traumatic stress disorder (PTSD), obsessive compulsive disorder (OCD) and eating disorders. CBT therapists are quite active in the sessions, almost like a personal trainer in a gym. So-called ‘third wave’ CBT also brings in mindfulness as a skill to help with recurrent intrusive thoughts. Here the emphasis is on understanding how a person’s upbringing has contributed to their unconscious thoughts and perceptions – and how these affect current behaviours and mental health. Psychoanalytic psychotherapy and Jungian therapy are related terms. They bring about change by helping process the defence mechanisms we use to avoid difficult and disabling emotions. Some therapies are fusions of two of the above types. Cognitive analytical therapy is good for complex and deep-seated depression. Dialectical behavioural therapy and mentalisation-based therapy are good for personality disorders. There are many other forms too, such as art therapy, family therapy, group therapy and couples therapy. Counsellors and Psychotherapists are regulated by their registering bodies to ensure adequate training and ongoing quality. Accredited Counsellors and Psychotherapists can be found through the following links, though of course the Mental Health Access Pack cannot make any particular recommendation or offer any guarantees.